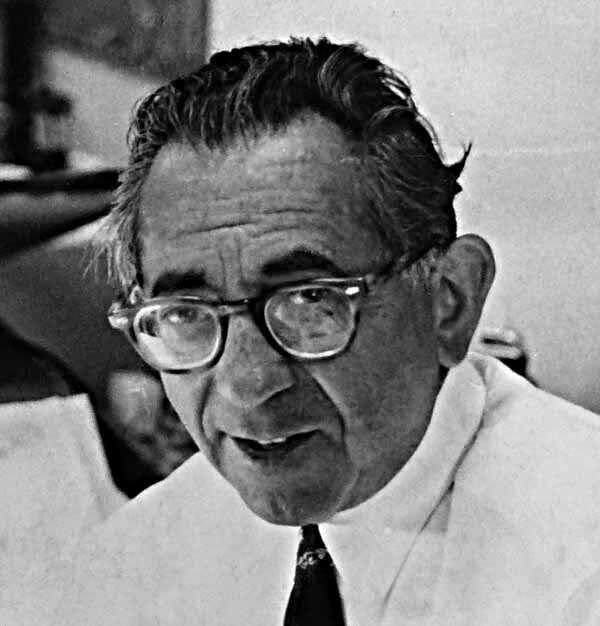 Ira Schnapp in the National (DC) Comics offices, 1955. Photo by Martin Schnapp, used with permission. 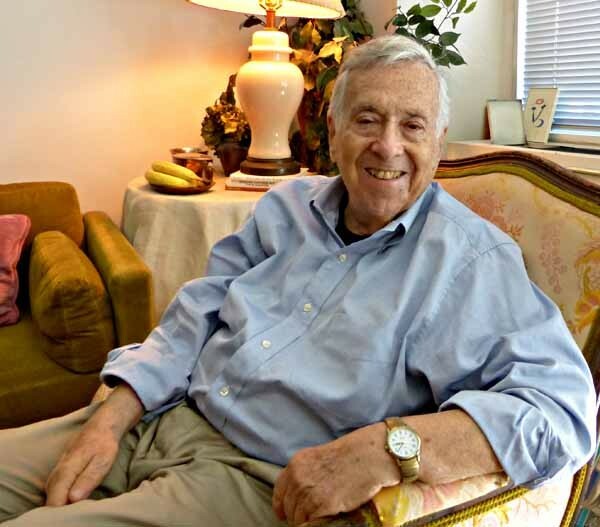 For the past few years I’ve been writing about the life and work of Ira Schnapp on my blog. Ira was first employed by the company now known as DC Comics in 1940, when he redesigned the Superman logo of Joe Shuster, and did it so well that it remained on all the company’s Superman comics and stories until the 1980s. Ira began lettering story pages and newspaper strips for DC, as well as designing more logos, and by the late 1940s, Ira had taken a staff position at the company as the in-house logo, cover lettering and house ad designer, while continuing to letter stories as well. A small sampling of Ira’s cover logos is above. Millions of comics fans knew his work. Almost single-handed, he set the style for the comics publisher with masterful, appealing graphics, but no readers knew his name or anything about him. As far as I can tell, Ira received only two lettering credits for his page lettering, and none for his other work. Not much has been known or written about Ira Schnapp in the past, but in recent years, interest in him has grown due largely to a pioneering comics history series about Ira on the website “Dial B for Blog.” In the past few months, fellow logo designer Alex Jay and I have been doing new research on Ira. Alex is an excellent investigator in areas like census data and newspaper articles, and has gradually uncovered many details about Ira’s work and family, and that’s the focus of this blog article series. We hope to shed new light on the subject. For instance, until now, there has been no known photograph of Ira Schnapp, but our research has uncovered two, one of which begins this article. A while back, Alex emailed me a phone number he believed was for Ira Schnapp’s son, Martin, who would be quite old himself by now. It took me a while to get up the nerve to to try cold calling the number. When I did, I reached an answering machine for Marty Schnapp. I left a somewhat incoherent message and my phone number, asking Marty to call me back to talk about his father, Ira, if I had the right person. That evening, he did call back, and it WAS Ira’s son! We talked for a few minutes, then I made an appointment to call him again for a longer conversation, once I could get my notes and questions together, not to mention my nerves. I spoke to Marty and his wife Pam twice in June, and to Marty once in August, about 40 minutes each time and learned a lot about Ira and his family. On Sept. 20th I was able to visit Marty in his New York apartment for another talk, and see a few family photos that are included here. Marty was born in 1930, so his memories begin in that decade. He lives on the Upper East Side of Manhattan, not far from where he grew up, and is still working at the age of 85. Of course I wanted to know what Ira was like, and what Marty remembered about him, and here’s what he said. Marty continued, “Ira did his printing. He worked a lot at home. I remember him sitting at a desk, working at home. That was the lettering. He must have gotten paid by the page. I remember him bringing me back comic books. SUPERMAN, ACTION COMICS, BATMAN, those were the main ones I liked. “Ira was very quiet at home. Very soft-spoken. I don’t think he had any real hobbies. He did painting and things like that. I don’t recall him ever selling any. He didn’t talk about his work or school. It’s funny how I don’t remember conversations with him. I know he took me to a few Yankee games. I liked sports, my father really didn’t. I have no artistic ability. I was always good at math. I don’t really remember looking over his shoulder at his work. I can’t remember ever sitting down and having a conversation with him. While it was wonderful to meet and talk to Marty, unfortunately he doesn’t know or remember much about his father’s work. Marty said no one in the family had a camera, and they’ve never been very interested in photos. The few images he allowed me to use here are all he’s been able to find among his things. In today’s image-flooded culture that’s hard to imagine, but probably true for many then. 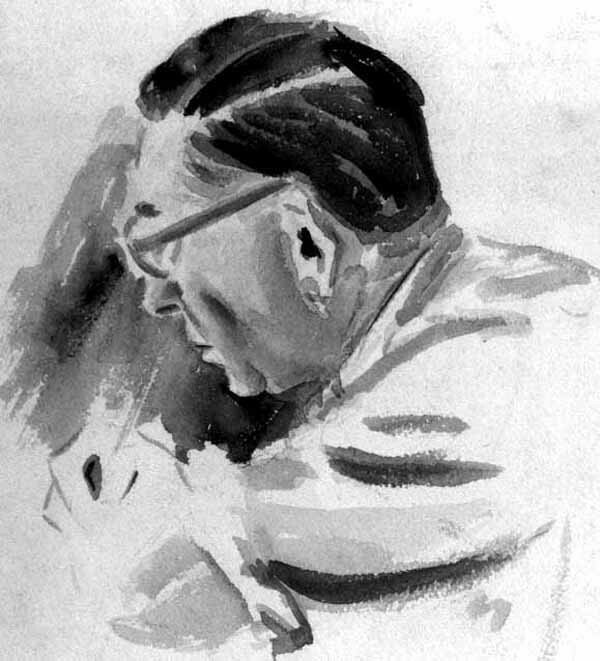 Previously, the only image we had of Ira is the above watercolor by co-worker Jack Adler, which Marty said is a very good likeness of his father. Marty related many other things about the Schnapp family, and I’ll be including them in this series as they come up, but let’s start much earlier than that. The story of the Schnapp family, as far back as we can trace it, begins in the small town now known as Sasiv in Ukraine. 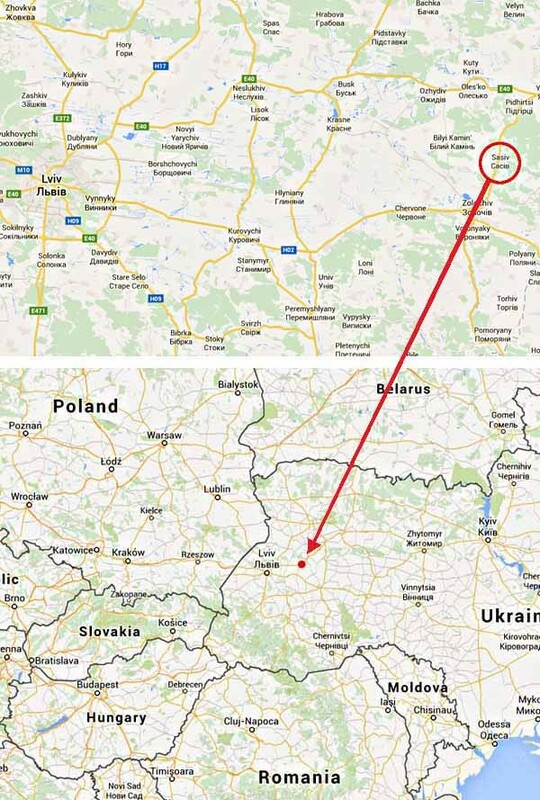 The town is also called Cacia, Sasów, Sasov and as the Schnapps knew it, Sassow. Before 1772 it was ruled by Poland and was in the territory of Ruthenia. From 1772 to 1919 it was part of the Austro-Hungarian territory of Galacia. From 1919 to 1945 it was again part of Poland. After occupation by Nazi Germany in World War Two, the area was incorporated into the U.S.S.R. territory of Ukraine, and remains in the now separate nation of Ukraine. As you can see, it was much contested. North of the Carpathian Mountains, and next to the Bug River, it was known from 1638 for its paper mill, and was on an important trade route. The mill grew to be one of the largest in Europe, but was destroyed in World War One. A Jewish community began to grow in Sassow in the 1700s when some laws were passed favorable to them, in contrast to many other places. By 1764 there were 223 Jews living in the town, and by 1880 there were 1,906. The town’s Jewish population produced candles and ornamental strips for prayer shawls, but during the 1800s, new laws restricting the kinds of jobs Jews could have made life more difficult, and pushed many into poverty. It was from this situation that Jews from all of Galacia, including Sassow, began to emigrate to the United States, and Ira Schnapp’s father Max Schnapp was one of them in 1895. Ace researcher Alex Jay has found a number of documents relating to the Schnapp family, some not described or seen before as far as we know, and they provide details about the family’s early days in America. Let’s look at them. 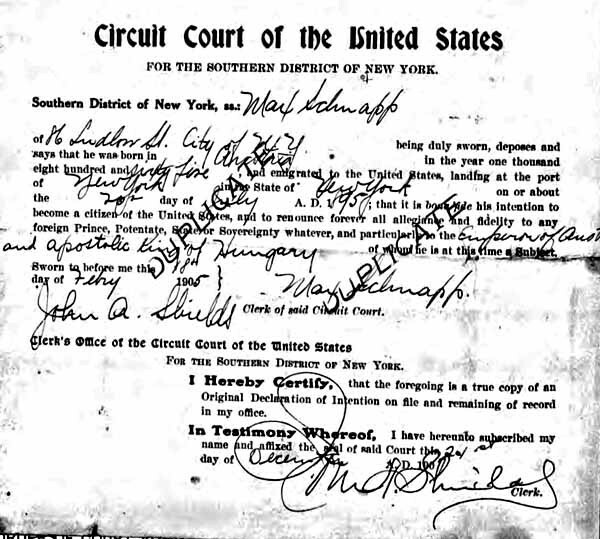 Among the earliest documents about the family of Max Schnapp are his Naturalization Papers. Acquiring U.S. citizenship at the time required two documents. The first was a Declaration of Intention, above, often filed by new arrivals soon after reaching the country, but not always. 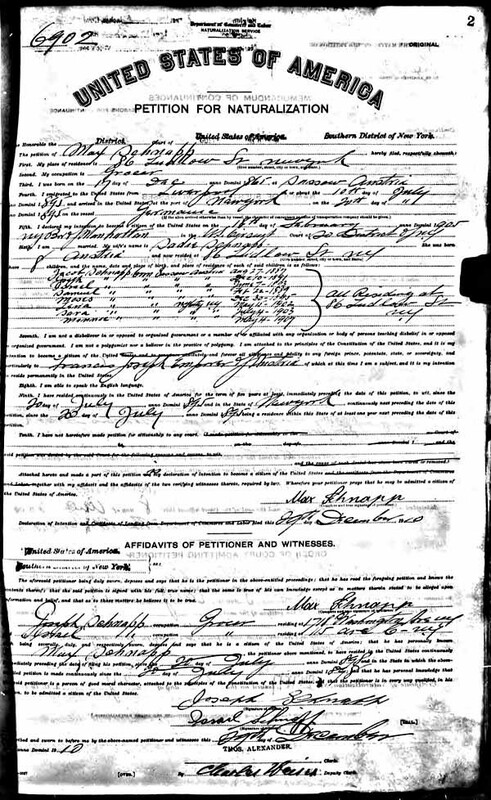 Max Schnapp filed this one on Feb. 18th, 1905, ten years after he arrived. One reason for the delay may be that Max needed to learn English to become a citizen, or at least enough to understand and reply to the clerk filling out the document. (Max’s native language was Yiddish, and he may also have spoken German or Austro-Bavarian.) 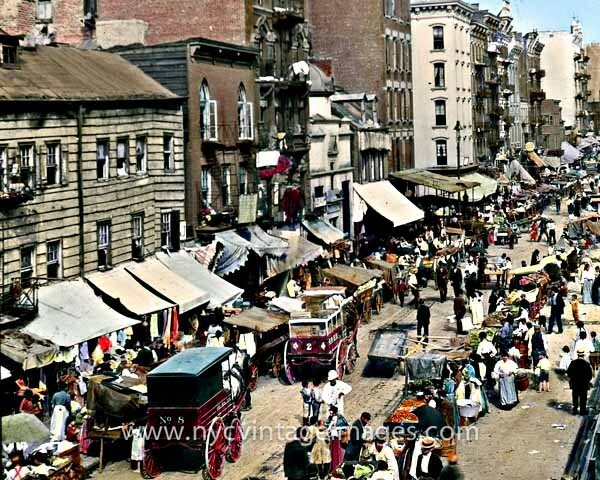 It states that Max Schnapp of 86 Ludlow Street, City of New York was born in Austria in 1865 and emigrated to the U.S., landing at the port of New York on July 20th, 1895. He swears to renounce all allegiance and fidelity to the Emperor of Austria and the Apostolic King of Hungary (the rulers of the Austro-Hungarian Empire). Max and his family still live at 86 Ludlow Street. He is employed as a grocer. He was born on Dec. 17th, 1865, making him 45 in December, 1910. He emigrated to the U.S. from Liverpool on July 10th, 1895, arriving here July 20th, so a ten day passage by ship. The ship name is hard to read, but it might be “Germaine.” If so, this was a Greek cargo ship that was sunk by a German submarine off the coast of Spain in 1916. We don’t know how Max traveled from Sassow to Liverpool, or who might have been with him, but all of his family remained in Sassow. His oldest son Jacob followed in 1898, and the rest of the family in 1900. Probably these emigrations happened once Max was well established at his grocery job and could send for his family. Using the birth years we believe are correct, in 1910 Jacob was 24, Samuel was 22, Joseph was 19, Israel (Ira) was 16, Moses was 15, Lena was 8, Sara was 7 and Minnie was 3. Until 1940, the wife and children (under age 21) of a naturalized citizen also became citizens, and this would apply to Sadie and all the children except the two oldest, Jacob and Samuel. Israel is the person we know as Ira Schnapp, so this document, when processed, would have made him a U.S. citizen. Also of interest are the two witnesses, both with the last name of Schnapp. We believe they’re related. It was a common practice for immigrants to find work through other family members already in America, and that’s likely what happened with Max when he arrived. Occupation for both witnesses is grocer, as with Max, and they probably worked together, or at least near each other. First we have Joseph Schnapp residing at 1718 Washington Ave., NY, which is in Brooklyn. Alex has found information on him suggesting he was born in Austria in 1877, making him 33, twelve years younger than Max. It’s likely he is Max’s cousin. It’s certainly not the Joseph who was Max’s son. Next we have another Israel Schnapp residing at 115 Avenue C, NY. A different document says he was Max’s nephew and 23 years old in 1910. Both witnesses have sworn that Max Schnapp has been a resident since July 20, 1898. This may be a clerical error, as Max said he arrived in 1895, or it may mean that’s when they started working together in the grocery business. Max and Israel lived in lower Manhattan on the East Side, fairly close to each other, and for a while in the same house. It was an area where immigrants from many countries first settled in America, and the center of Jewish culture at the time. Joseph was in Brooklyn, not too far away. It seems likely that their workplace as grocers was nearby, perhaps in the New Jewish Market, shown above in 1900 in a hand-colored photograph. There doesn’t seem to be any building at 86 Ludlow Street, the Schnapp home, today. We don’t know anything about the Schnapps’ family life or schooling, other than the few clues we have from census records. We’ll look at those next. As with other documents we’ll cover here, you have to keep in mind that records were copied down by census takers going from home to home, and there are lots of opportunities for errors to creep in: language difficulties, clerical mistakes, misunderstandings and so on. 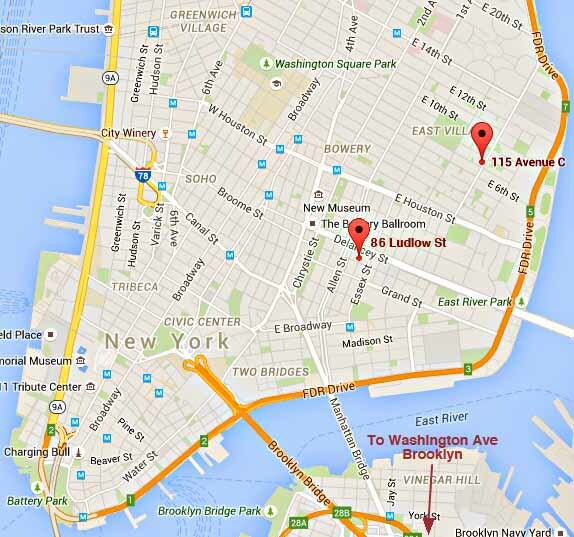 Most likely Ira went to New York’s Public School #188 on the Lower East Side, above, not far from his home. This was a very large school with many immigrant children, described in 1900 in THIS New York Times article. 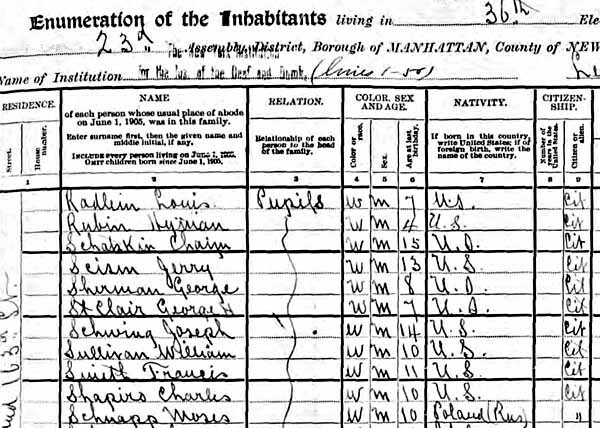 Moses Schnapp is on a different census sheet because he was deaf, and attended school at “The New York Institution for the Instruction of the Deaf and Dumb” at Riverside Drive and 163rd Street in the Washington Heights area of Manhattan some distance north and west of the Schnapp home. It’s likely Moses boarded at the school at least some of the year. His census entry, excerpt above, lists Moses as age 10 from Poland (Russia) and a citizen. Moses was not from Poland and not yet a citizen in 1905, though his parents would probably have welcomed that assumption if it helped him get into this special school, but these may simply be misunderstandings by the census taker. Max Schnapp and his family next show up in the 1910 federal census, excerpt above. Their home is again at 86 Ludlow Street. It lists Max’s age as 45, Sadie as 42, Jacob is 22, Samuel is 20, Joseph is 17, Israel (Ira) is 15, Moses is 14, Lena is 8 and Sarah is 6. The youngest daughter, Minnie, would have been 3 but is not listed. Also here with the family is Israel Schnapp, 23, nephew. This must be the person who acted as a witness on Max’s Naturalization Papers. Also present is Freda Wohn (I think), a servant, age 20. The place of birth listed for the family through Moses is Austria Yiddish, meaning Jewish. For occupations, Max and Jacob are both Retail Merchant – Groceries on their own account, while Samuel is a Salesman – Headwear, meaning hats, and collecting wages. The rest of the family, including Ira, have no occupation listed. Nephew Israel’s occupation is written over twice, but I think it’s Grocer – own store. For education, all the Schnapp children can read and write, and Joseph, Ira, Moses, Lena and Sarah are attending school. Language spoken for the parents is Yiddish, for all the children it’s English. Among the many mysteries of Ira Schnapp’s career is what training he might have had in art. 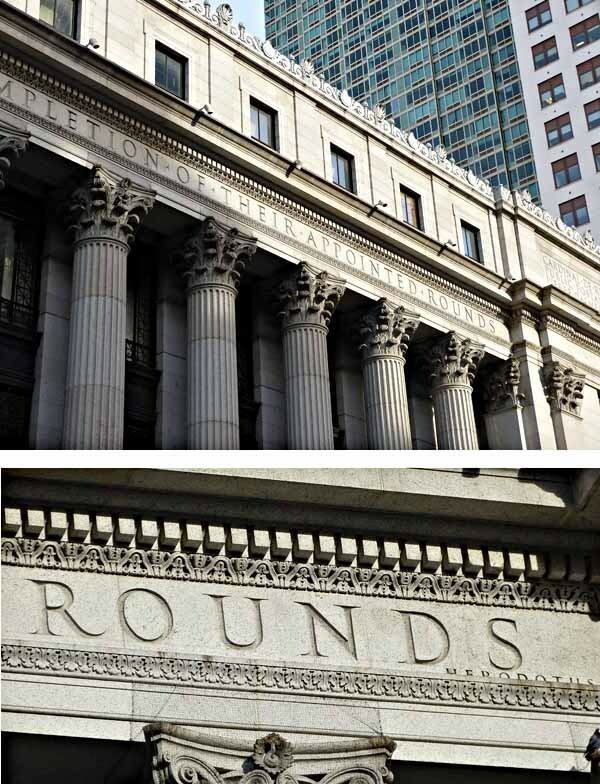 In later years, Ira often told stories about work he’d done designing or helping to design very large carved inscriptions on monumental New York buildings like the James A. Farley Post Office (above) on 8th Avenue between 31st and 33rd Streets. 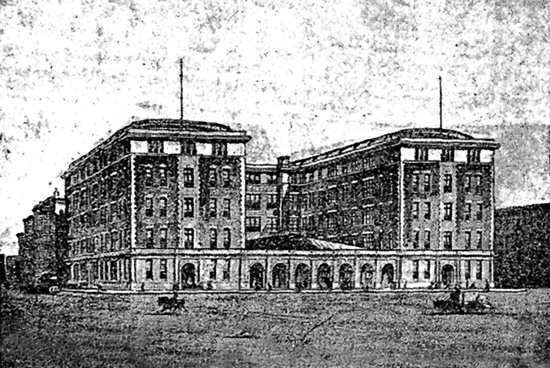 That building was designed by the firm of McKim, Mead and White and constructed from 1908 to 1912, when Ira would have been ages 14-18. I’ve recently done new research on the Farley building and its inscriptions and Ira’s part in it, which you can read HERE. To summarize, I believe what young Ira did was enlarge and perfect the architect’s lettering so that it could be transferred to marble slabs and carved by stone-cutters. I’m guessing he was employed or taken on by the sub-contractor handling that, and he may have done similar work for inscriptions on other buildings like the main New York Public Library and Grand Central Station. How he got such work is unknown, but I’m sure it was exciting to be part of those massive and important projects, and they helped set the teenager on a career working with letters and design. Ira’s son Marty also heard from him that he was proud to have worked on the carvings for the Farley Post Office. We’ll continue with more about Ira’s work and family next time. Other articles you might enjoy can be found on the COMICS CREATION and LOGO LINKS pages of my blog. This entry was posted in Creating Comics, Lettering/Fonts on September 25, 2015 by Todd. It is always a delight learning new stuff about comics worker bee creators. This is one of those times!